My eyes were transfixed out of the window, gazing at the endless awe inspiring vista punctuated with jagged peaks, clouds kissing the mountains, changing landscapes and endless colors sprinkled with magical dust. It was like diving into a beautiful painting. No wonder we were at the stunning Scotland – The Land of kilt-wearing and bagpipe-playing Scots. 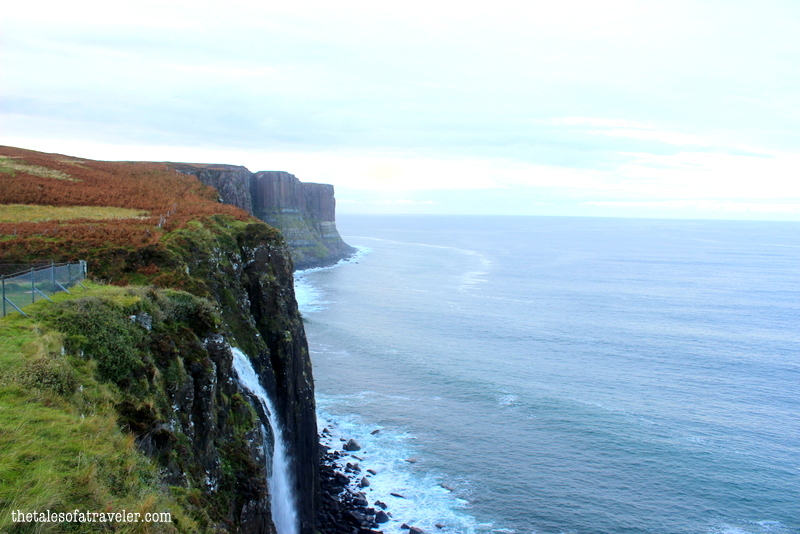 When we were planning our trip to Scotland we wanted to squeeze in as much as possible in our 5 day itinerary. 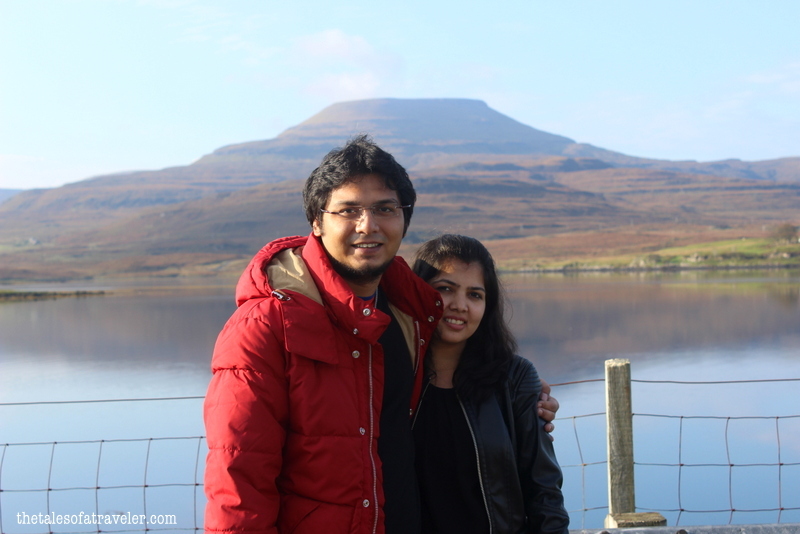 So after spending our first 2 days at Edinburgh and getting awed at the Royal Mile, marveling at the stone walled buildings and sampling some of the best Single Malt whiskies, we booked ourselves a 3 day Isle of Skye tour with Rabbies Trail Burners to take in all that the magnificent highlands had to offer. We stopped at all the major sites and our guide gave us ample time to take pictures, walk around, and simply stretch our legs when needed. Even bathroom breaks were timed well and we never had any issues. 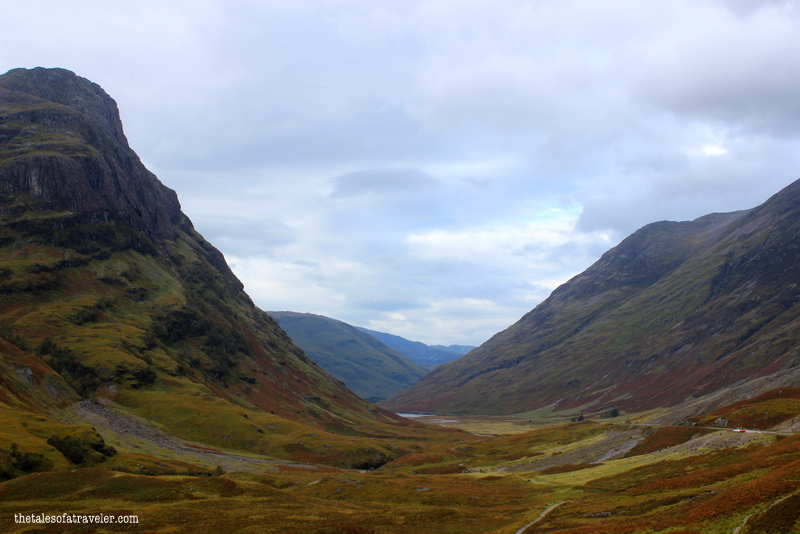 Scotland took our breath away with each passing mile and every turn that we took, it all looked so out of a fairy tale. Our guide – Mackenzie (Mac) told us endless stories about clans, fairies, witches, Prince and giants and would add the drama with choicest of Scottish music. And like young kids we would be listening to his stories with rapt attention. 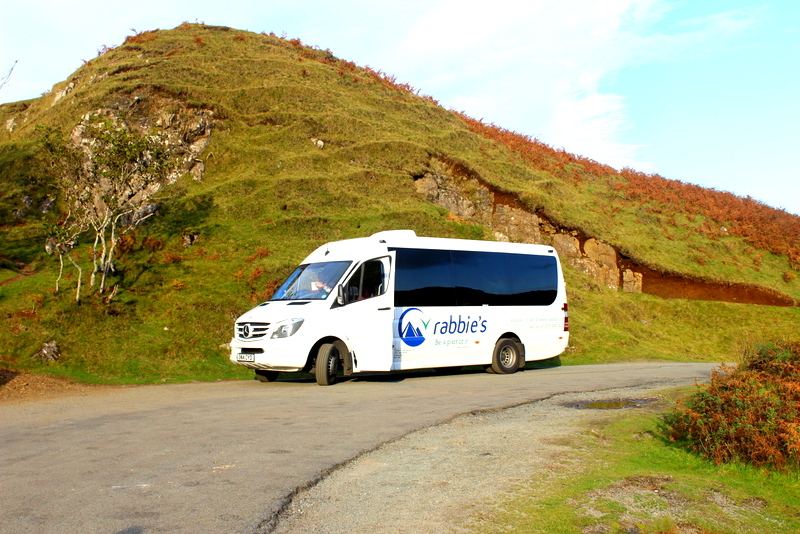 Rabbies Trail Burners is a tour company based out of Edinburgh, Scotland with tour operations in Ireland, Scotland and England. They provide small group tours in a 16-seater Mercedes-Benz mini bus and a knowledgeable guide to take you around the spots. 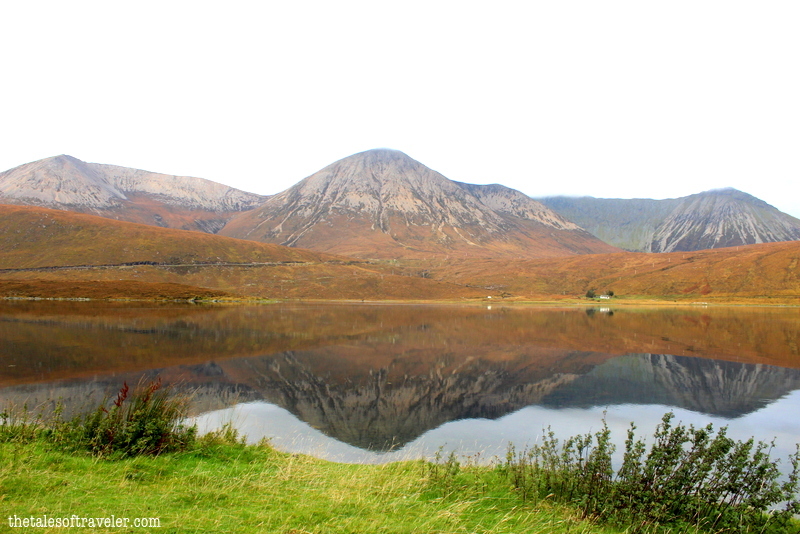 Join us on a magical drive to otherworldly landscape of Skye, Scotland – home to countless legends. We checked out of the hotel at about 8 AM all bundled up to brave the wind, cold and sunshine and dragged our luggage across the North Bridge to Waterloo Place. The office of Rabbies Tours and Trail Burners is in a cute little cafe at the corner of Waterloo place, a stones throw distance from Waverley Station. We grabbed a cup of coffee and a burger from the cafe and headed towards the mini coach which was parked down the lane. 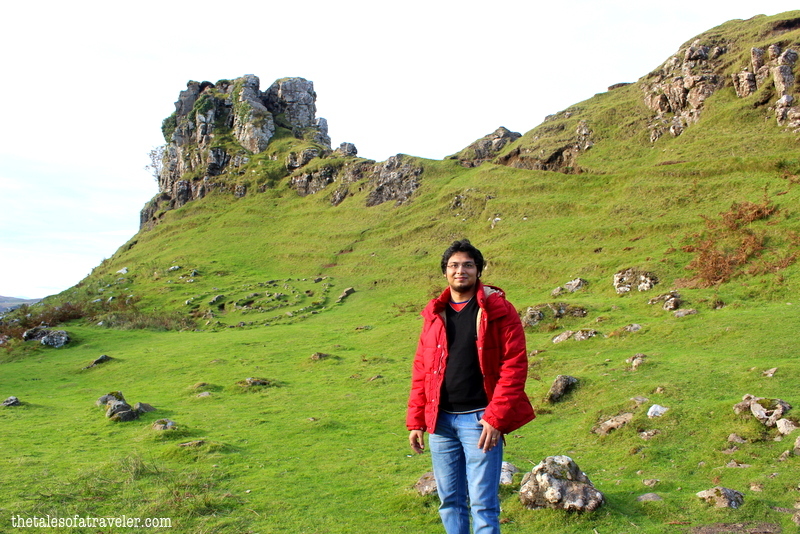 We joined 14 other fellow travelers who were there to explore the magical world of Skye. Most of our co travelers were women excepting for Sam and a guy from Turkey. It was mixed crowd of different age groups and from different geographic locations, from Australia to Guatemala. We were welcomed by our guide Mackenzie aka Mac and were quickly ushered into the minivan. As the minivan started its journey, Mac started telling us a brief history about Scotland, the struggle, its geography and its current political situation. Slowly we left the stone walled city, to be greeted by wide deserted roads, vast expanse of farms and hordes of sheep grazing as far as the eye could see. The Scotts are known to be good story tellers and Mac was no exception. He was jovial and had immesnse knowledge about the history of Scotland. The fact was that he was himself a traveler and after traveling for good 12 years and staying at different location for months he is happily settled now in his home town doing what he loves the most, traveling and showing the beauty of Scotland. The one thing which makes him different and linger in our memories was his effort to keep the country clean. Everywhere we used to stop he made sure to collect his garbage collecting stick and pick on all the polythene and plastic bottles littered around. I wonder in India if we all start doing that definitely our Swacch Bharat Abhiyan would be a big hit with a kind of population we have. While driving, Mac narrated us many Scottish folklores and stories about the different clans of the Highlands and made different sounds while narrating these stories. Even he played beautiful local scottish music with his narrations which added magic to the beautiful journey. He also knew when to give us time to doze off and rest. We stopped at many picturesque locations, Mac’s intention was to ensure we got a glimpse of all the beautiful things on the way to Skye. To be honest, we think we made the right decision of traveling with Rabbies Trail Burners and not renting a car and driving on our own. We would have definitely missed some hidden gems and detours. 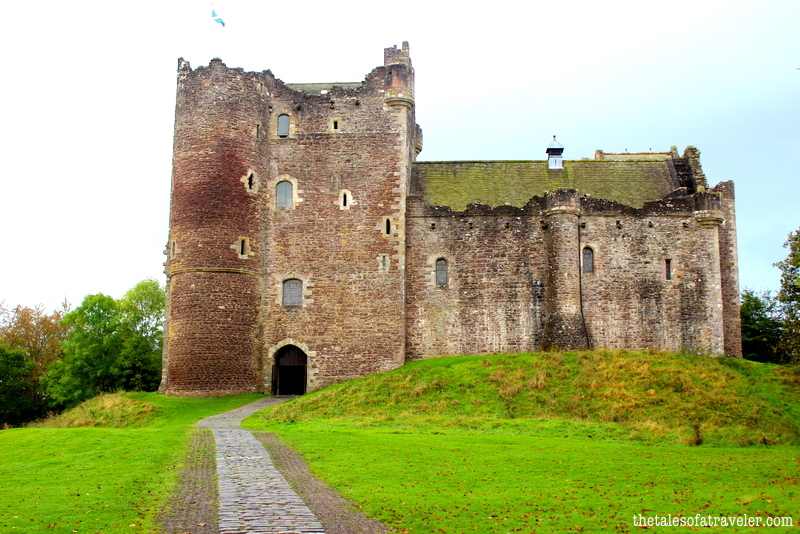 The first stop of the day was the beautiful Doune Castle perched beside the river Teith in Sterling district of Scotland. The crumbling castle stands tall in contrast to the greenery all around. 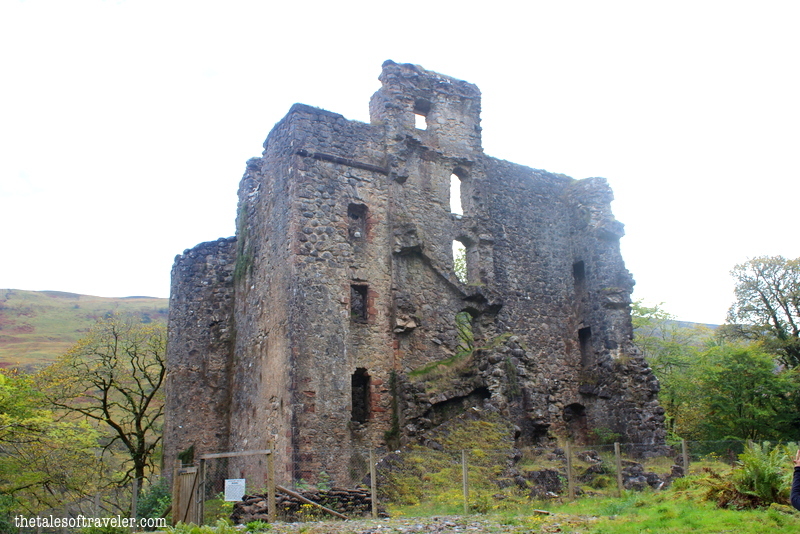 The castle was originally built in the 13th century by the Regent of Scotland. This castle has seen many wars but today it serves as reminder of the bygone era and is mostly used for private weddings. 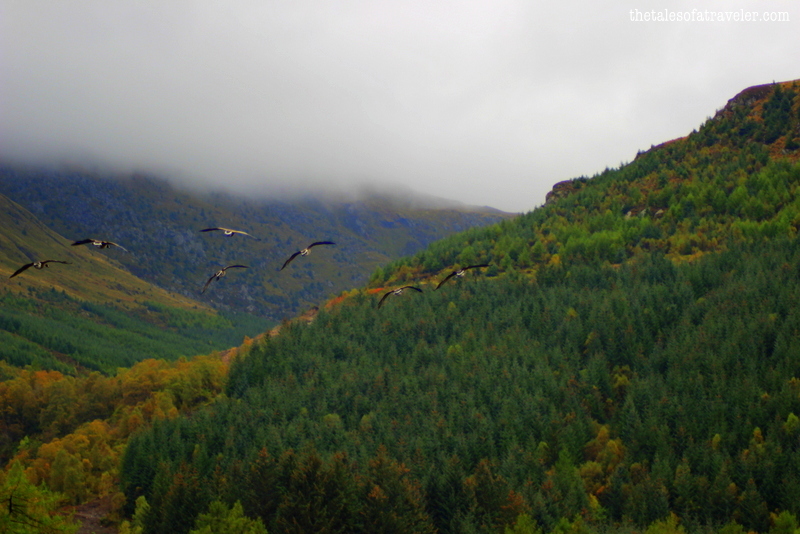 After spending some time at the Doune Castle we drove on A84 towards Skye, stopping at Loch Lubnaig. 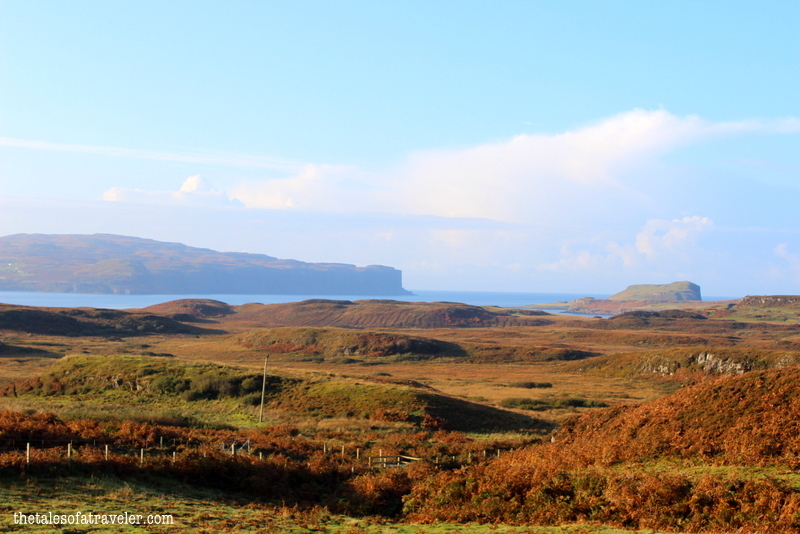 The views were getting more stunning with each mile that we moved towards the Isle of Skye. Especially the vistas around this lake were so stunning that we did not feel like leaving from here. A perfect place for some “Me” time. 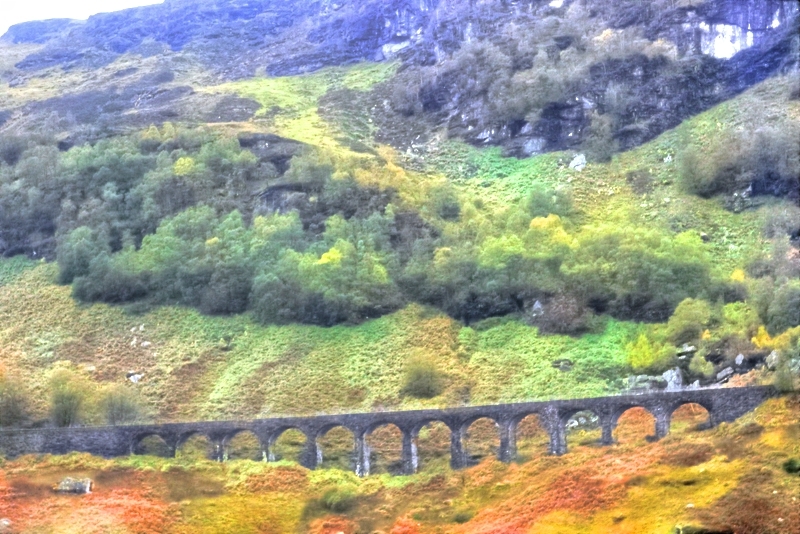 While on our way to Skye we also saw the famous Hogwarts Express Train line which was popularized in the Harry Potter movie. 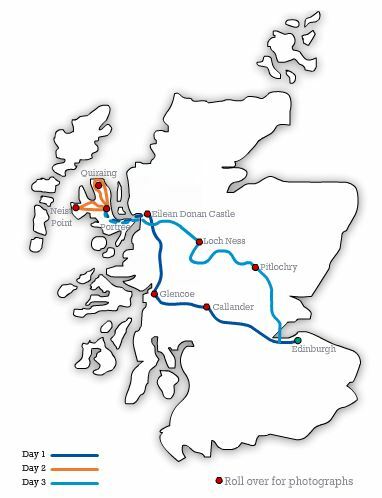 This train line is the West Highland line and it runs from Fort William to Malliag. 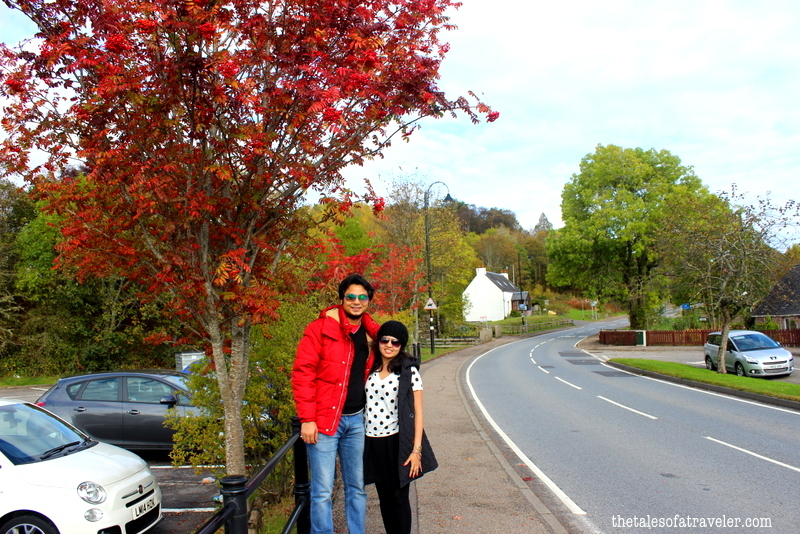 We landed at The Falls Of Dochart Inn, the entire place seemed to have been painted in the hues of fall. The street was dotted with cute little cafes and B&B’s. The meandering river seemed to have its own mind and soul, the lapping sound of the water against the rocks felt as if nature had its own symphony to play. 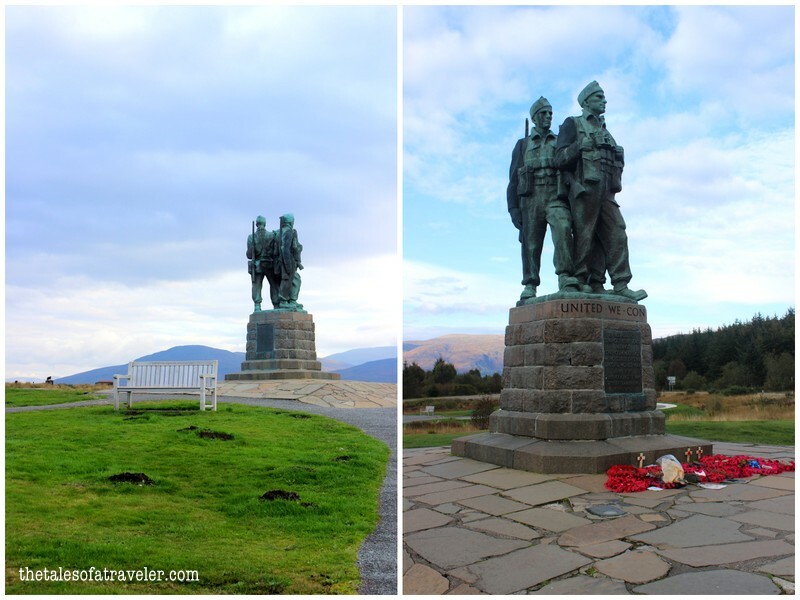 Later on our way we stopped at the Commando Memorial which is dedicated to the commandos who laid down their lives in the service of the country during the WW2 (1939 -1945). The memorial was unveiled by Queen Elizabeth on 27th Sept 1952. Being an avid follower of the WW2, I found this place to be a part of an era which rewrote the world history for generations to come. There was so much of silence that prevailed all around and a lonely bench at the memorial spoke a volume about the history. Next was a quick stop at the community hall of Glengarry for a quick break to refresh ourselves. The community hall was surrounded by farmlands and forests. 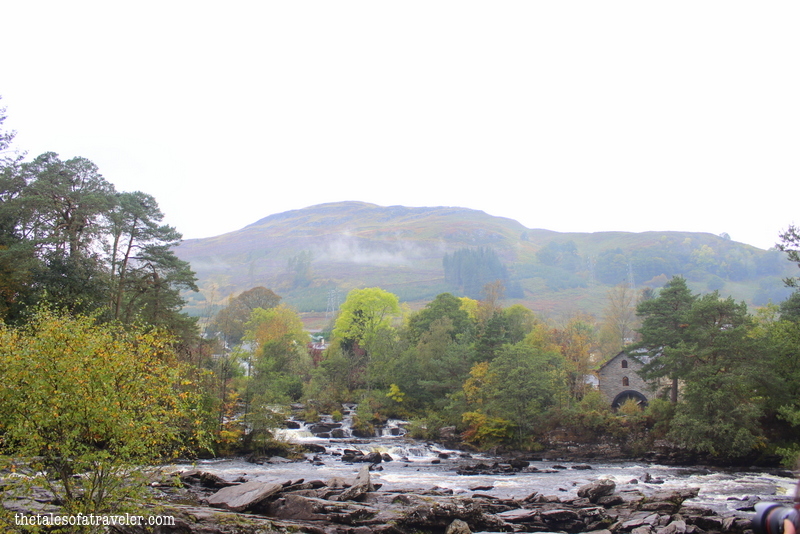 Glengarry is the home of the MacDonell clan of the Scottish Highlands. Mac told us the stories about the MacDonell clan which is one of the largest Scottish clans. The last stop of the day was Eilean Donan Castle, though we did not go into the castle on day 1, we stopped for some photo ops with the Eilean Donan Castle in the background. More about the castle on Day 3. 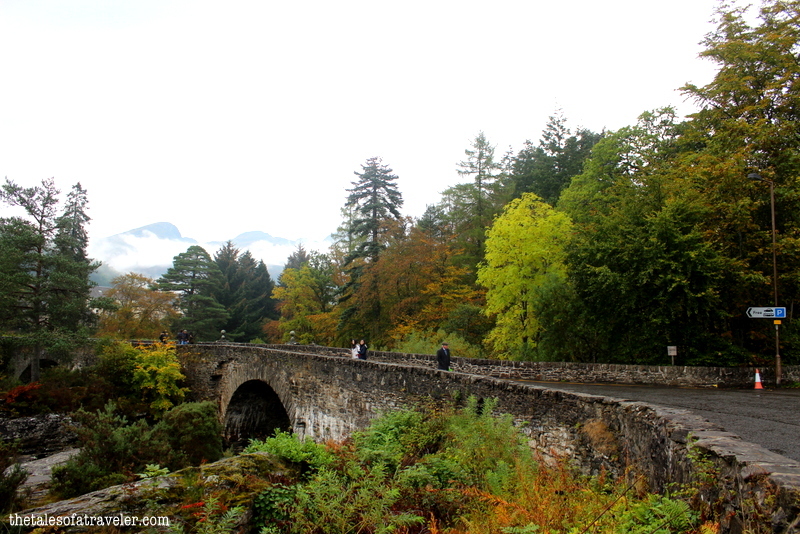 At the end of the day, we crossed the famous Skye bridge to reach the port town of Portree. Portree is a small town which serves as a ideal base for anyone to explore Skye. The town is dotted with beautiful B&B’s and pretty little cafes and restaurants. 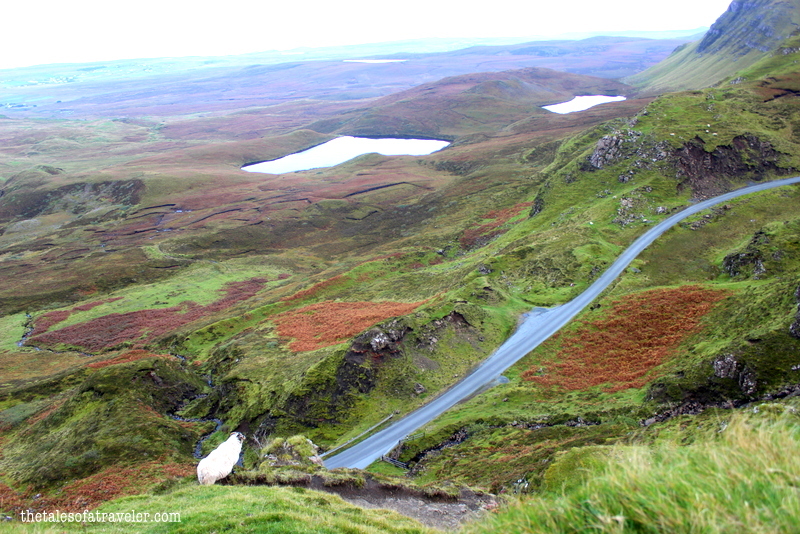 By the time we reached Portree it was 7 PM and we could hardly find anyone on the roads. After dumping our luggage in a cute little cottage, we walked towards the city center for dinner. Our stay was booked by Rabbies Trail Burners. We woke up around 6 AM in the morning and had a full Scottish breakfast with eggs, fried tomato and mushroom which was cooked and served by the cottage owners (a middle aged couple). Scottish people are known for their hospitality, the cottage owners ensured that we were full to our brims before we left for the day to explore Skye. We were picked up from our cottage at around 8:30 AM by Mac. 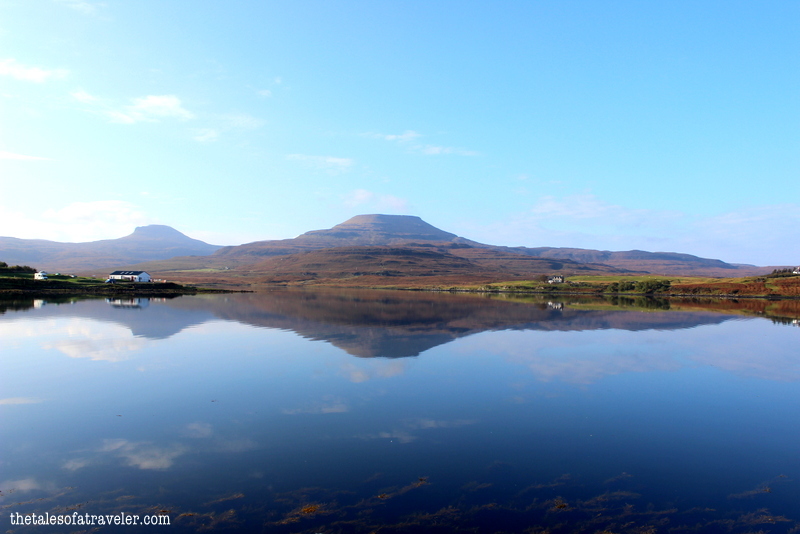 It seemed as if luck was on our side as it was full on bright day in Skye in the month of October and we were all set to explore Skye. What is a road trip, without stopping at picturesque locations that you pass by. 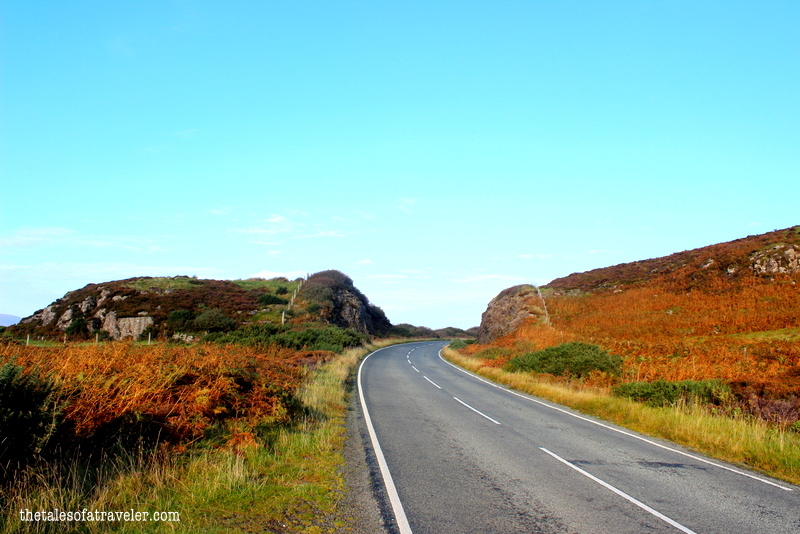 For miles there was not even a single person but fresh tarmac, expanses of brown peat bog and beautiful Lochs and Glens. 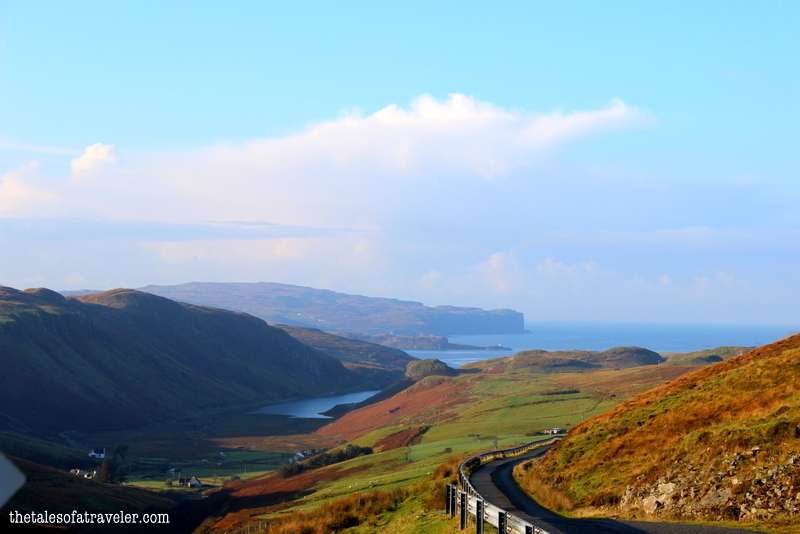 It is said that the journey is more important than the destination and we could not agree more while traveling in Skye. 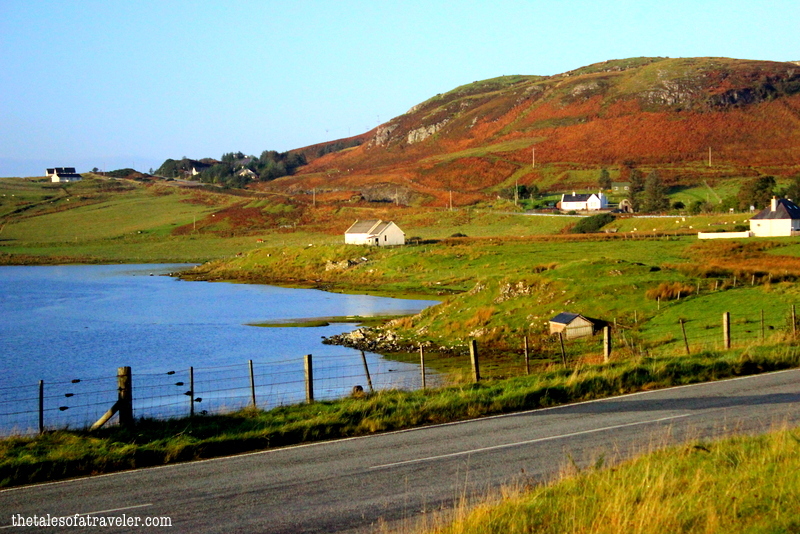 As we drove further west, we passed by charming villages right next to the Loch with cottages dotted all around that seemed to float in the cradle of the surrounding hills and hordes of sheep grazing on the farmlands. Just imagine waking up to views like this. Surreal isn’t it? Located about 1 kilometer northwest of the village of Struan on the west coast of the island of Skye is Dun Beag Broch over looking Loch Bracaldale. It looked like a defensive port though the exact history around a Broch is still a mystery. A easy hike up following the trails created by sheep grazing took us to the remains of the broch. Once a defensive port is now reduced to some massive walls and crumbling stones. Its in a fashion of circular structure with numerous small and big chambers. As per wiki ” The interior has a diameter of about 11 metres, and the entrance is on the east side. Internally three openings are visible in the broch wall.One leads to a small chamber; a second leads to a long narrow gallery within the wall; and a third leads to the stone stair of which some twenty steps survive”. After admiring the pre historic civil engineering marvel which is dated back to Scotland’s Iron-Age farmers, we continued our journey towards Neist Point. 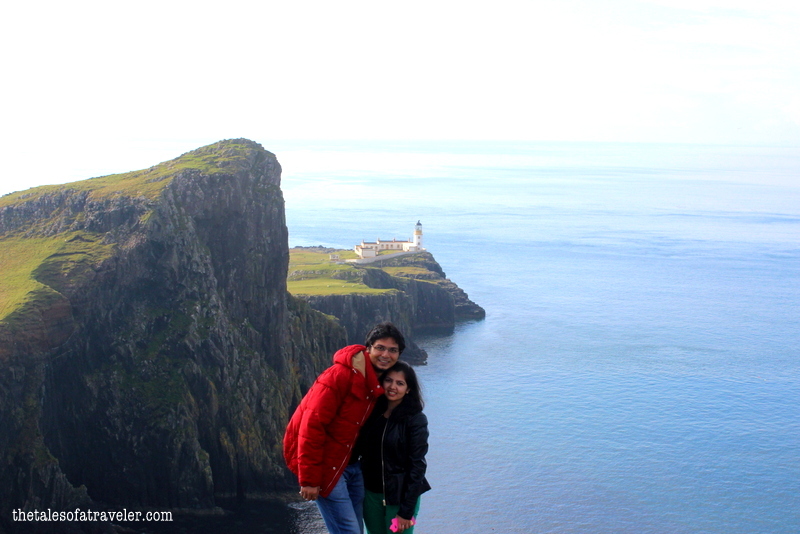 Neist Point is the western most point in Skye. When we reached Neist Point it was very windy and Mac asked us to stay away from the edges as there were no guard rails. Battling against strong winds we followed the sheep grazed path. 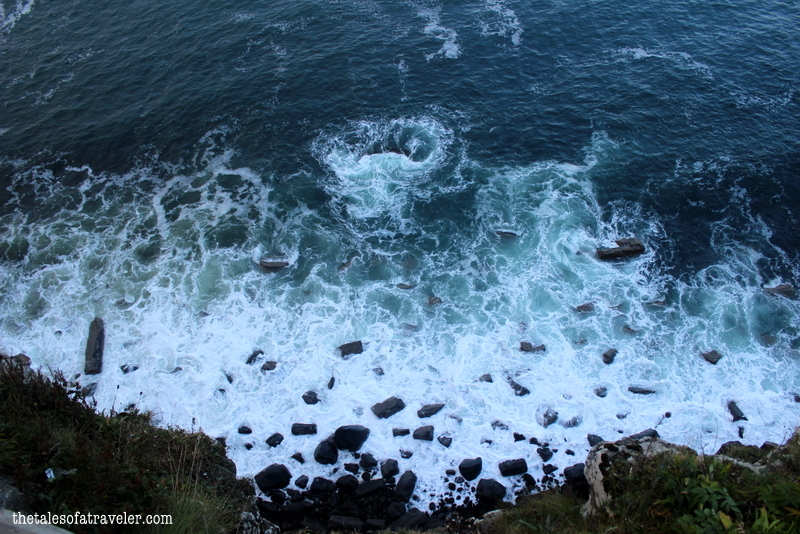 It was as scenic as we had heard about it, waves crashing the soaring high cliffs and a stunning lighthouse perched on the edges overlooking the Atlantic Ocean. The view from the top was surreal. 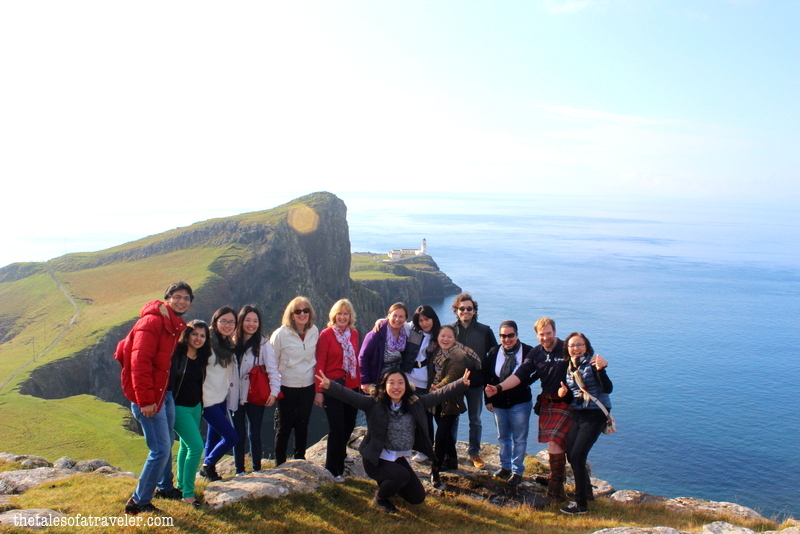 With this beautiful backdrop we did not miss to take a group photo with our fellow travelers. No doubt it is one of the top destinations for landscape photography. 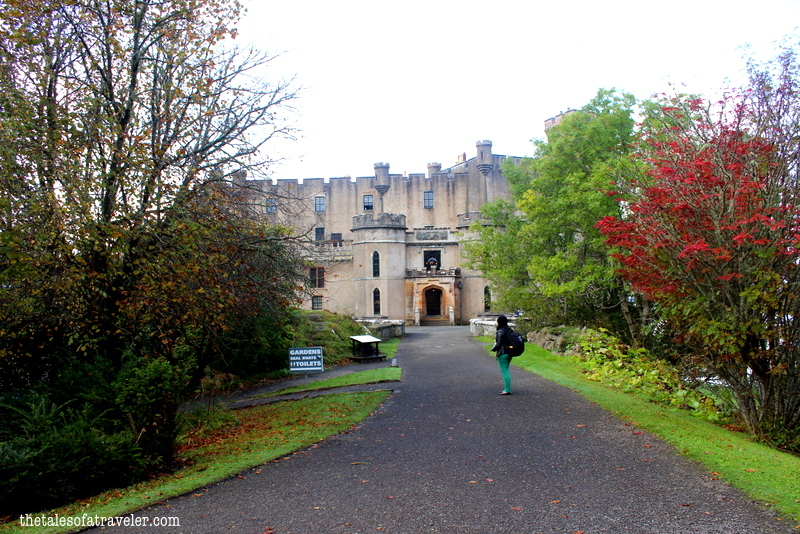 Our next stop was Dunvegan Castle, which is tucked amidst greenery and woodlands and beside the beautiful Loch Dunvegan. The magnificent castle is steeped in history and every nook and cranny, tells tales of the glorious history of the Clan McLeod of Scotland. 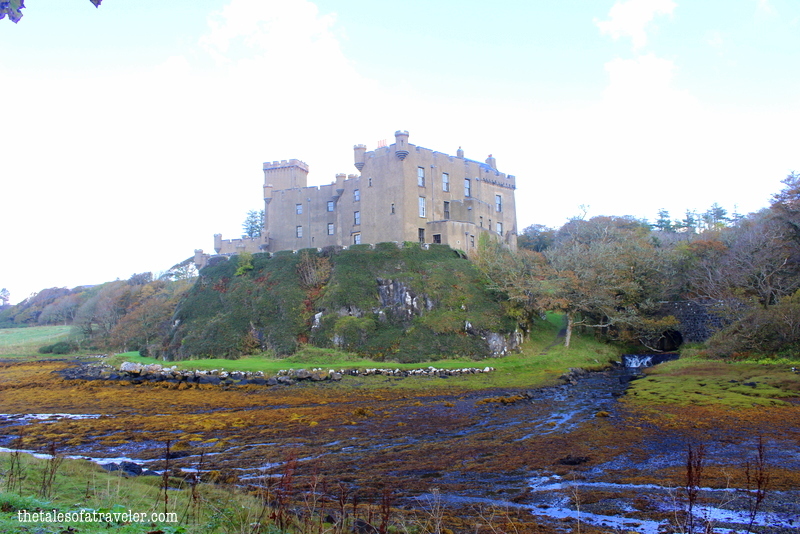 The castle has been the seat of the power of the clan chief for the last 800 years. Just beyond the main door of the castle is a majestic staircase with red carpet laid on top of it. There are gifts and artifacts on display in glass cases and dotted with beautiful life size oil paintings.The most famous being the Dunvegan Cup, Rory Mor’s horn and the Fairy Flag. It is said that a fairy had given the flag to one of the clan chiefs and is considered to have magical powers. It has been carried into many battles by clan chiefs for good luck. The rooms had ceiling to floor curtains and oak furnitures. Each room was elegantly designed and tastefully decorated keeping the original set up in mind. The castle also offers seal tours and cottages for rent. The entry to this castle is chargeable and it is open from 29th March to 15th October. So, do plan your visit accordingly. 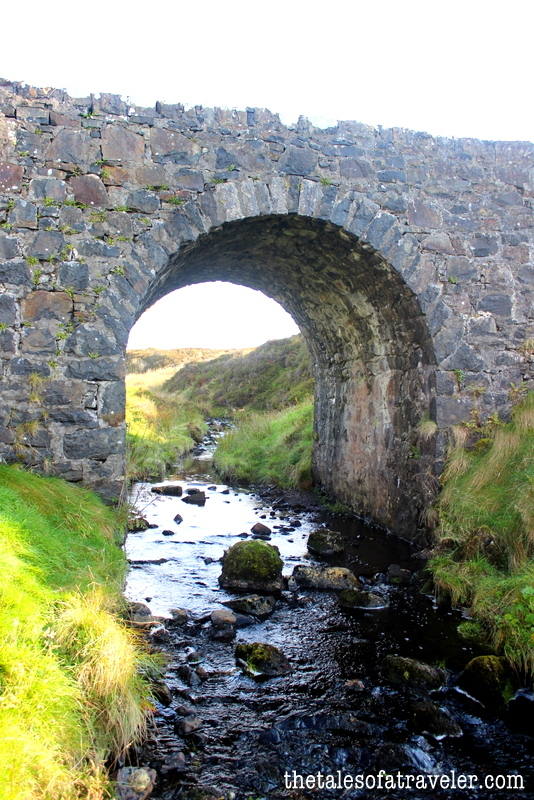 On our way back from Dunvegan Castle we stopped by a small bridge popularly known as the Fairy Barn. It is said that the water from the stream has magical qualities and that one’s beauty is preserved forever by sprinkling the water from the Barn on your face. This was the same place where the fairy gave the fairy flag and went back to the fairy land. You feel like believing this fantasy and imagining how it would have been way back then. 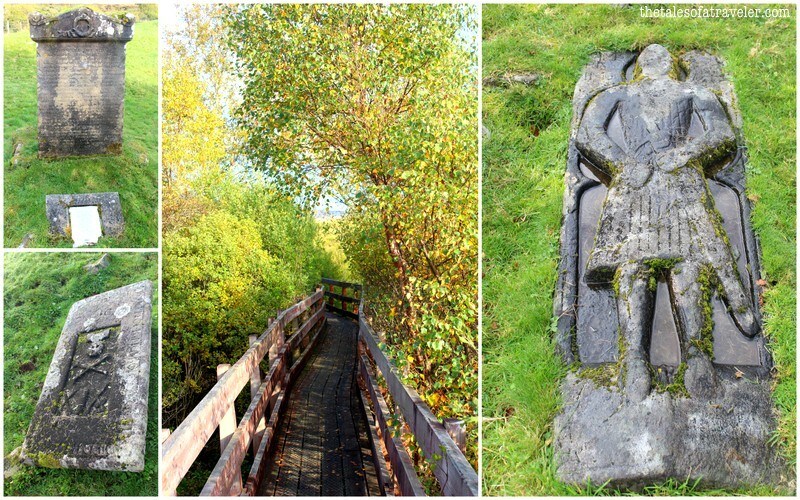 Just beside the river Snizort is Scotland’s well kept secret – St. Columba’s Isle. A burial ground sprinkled with ancient ruins and graves burried over centuries ago. St. Columba was the one who founded the cathedral of the bishops of the Isles which was the centre of Christianity in the Hebrides from 1079 to 1498. The small burial island is connected by a foot bridge and it is quite picturesque. Some of the graves also have life size carving of the buried person. The burial grounds are located a little off the road and chances are high that you might miss it if you are traveling on your own. 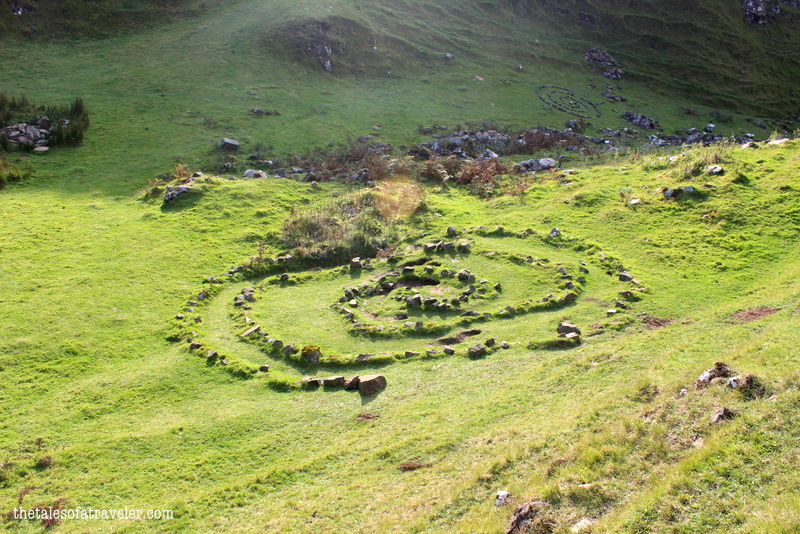 While driving towards Fairy Glen, Mac narrated another Scottish folklore about a Knight who met a Fairy at Fairy Glen and went with her to the Fairy Land. It is said that one minute in Fairy Land is equivalent to a 100 years, and when the Knight returned the world had moved on and everything had changed. His loved ones, his house and everything he knew was gone. And the Knight turned to dust when he realized what had happened to him. Then Mac added his own pun by saying, “Never talk to a stranger at Fairy Glen“. The unusual formation of rocks, distinctive jagged peaks of different size and geological oddities surely makes us believe that the glen is sprinkled with fairy dust. As we ascended towards Castle Ewen, which was perched on the top, we came across numerous rocks in circular pattern which was so perfectly placed that we wondered who had placed them. On asking about the formation to Mac, Mac told us no one knows how they are formed. No doubt Fairly Glen was peppered with pixie dust and the Scottish do believe in the existence of fairies. On our way back to the van, I could not shed off the thought from my mind about how these enormous circular rock formations are formed. This was one of my favourite spot in the skye. The views could not have been any better than this. Located on the east of the island, a small Loch Mealt drains from the 55 m high cliff made of basalt columns which has striking resemblance to a Scottish kilt into the Sound of Raasay. It is said the unique formation of cliffs were formed during the Jurassic Era. Fortunately the weather was pleasant. Mac even told us that water never reaches bottom when the winds are strong. Earlier there were also loss of life but now the edges are well fenced and it is one of the most popular view point of the skye. Quiraing has a set of otherworldly explicit rock formations covered with green slopes and is formed because of land slippages. On walking up the slopes you can see miles and miles of ridges in different sizes dotted all across. We walked on the land formation call The Table which is flat grassy area and is considered to have slipped from the summit. The Old Mann of Storr is a jagged rocky formation on the Trotternish peninsula and is formed because of land slip of the peninsula. Though we could not stop here, but we did take some photos from the van. Last and final day of the trip. 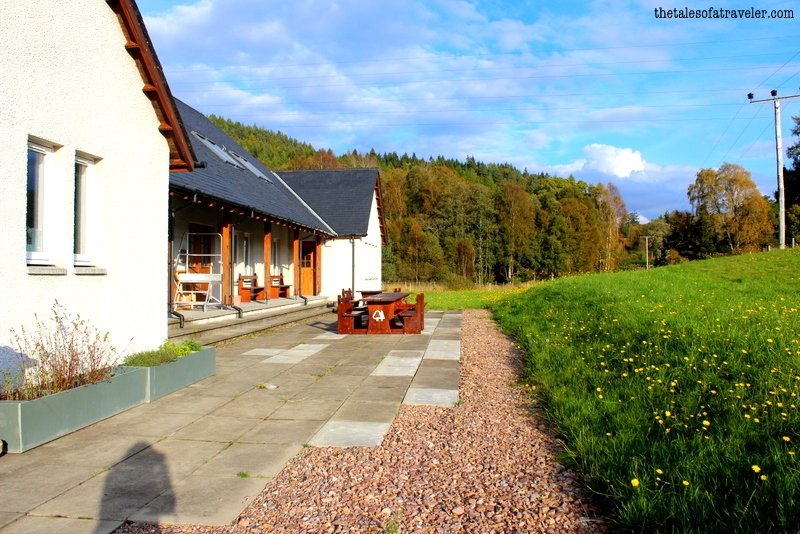 We checked out of our cute little cottage at 8:30 AM in the morning after having a full Scottish breakfast. Mac was there to pick us up from the cottage. This was the final day of the trip and we were to return to Edinburgh in the evening. So, bidding goodbye to our host and the beautiful town of Portee we headed towards the mainland. 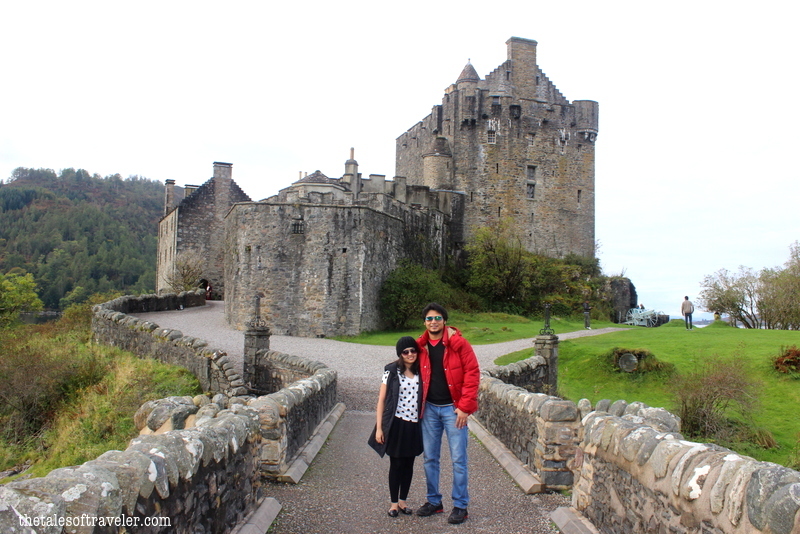 Our first stop was Eilean Donan Castle. 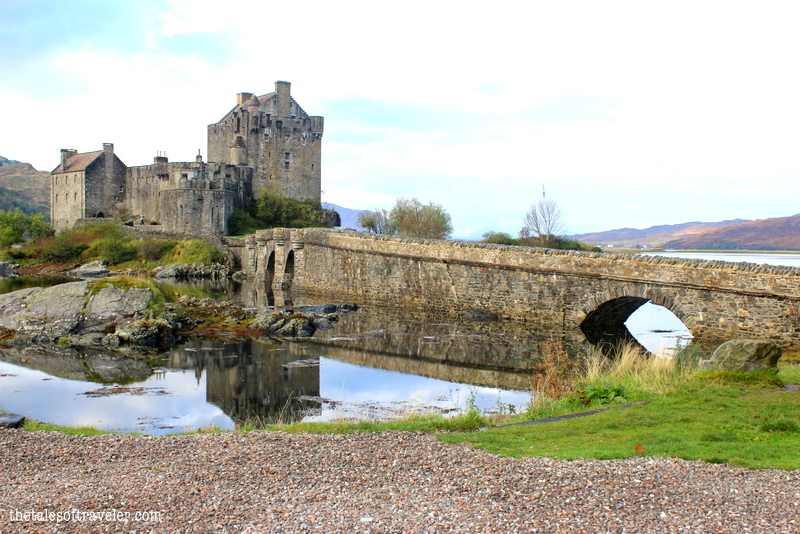 Chances are you can recognize it from a movie — Eilean Donan was the castle featured in Highlander, served as Sean Connery’s home in Entrapment, and was the Scottish Headquarters of MI6 in The World Is Not Enough. It has also been featured in the Bollywood movie Kuch Kuch Hota Hai title song. The castle is built on an island beside the confluence of the three great Lochs. The castle was first built in the 13th century and was destroyed during the Jocobite rising of the 18th century. It was restored again in the 20th century. Eilean Donan is considered to be one of most beautiful castles in Scotland and is also the most photographed monument in Scotland. Unfortunately photography inside the castle is not allowed and I think such a beautiful castle needs to be seen live. There are several floors in the castle to explore and guide around to explain. For me the highlight was the kitchen (which had all sorts of fake food displays which was fun and interesting). It looked so real. The five sisters of Kintail are five mountains in Kintail and this is one of the most famous ridge walk spots in Scotland. There is a legend associated with the Kintail mountains, it says that, Once upon a time there was King who had seven beautiful daughters. Two Knights sailed from a far off land and were smitten by the beauty of the two youngest daughters and wanted to marry them. The King was opposed to the marriage but eventually agreed when the two brothers said that they had 5 eligible brothers back at home who could marry the other five sisters. They promised the king that they would go home and convince their brothers to marry the five sisters. Reluctantly the King agreed for the marriage and the Knights along with their newly weds sailed away to their home. The Sisters waited for their Prince Charming to arrive and marry them. The wait turned from days to months and to years, the beauty of the sisters was starting to fade. The King got worried about this and asked a witch to preserve the beauty of his daughters for eternity. The witch gave him a potion and asked him to serve it to his daughters during dinner and the King obliged. The next morning when the king woke, he could not find his daughters. He searched for them and eventually found them but not as his beautiful daughters but as five beautiful mountains which stand till date and are the Five Sisters of Kintail. 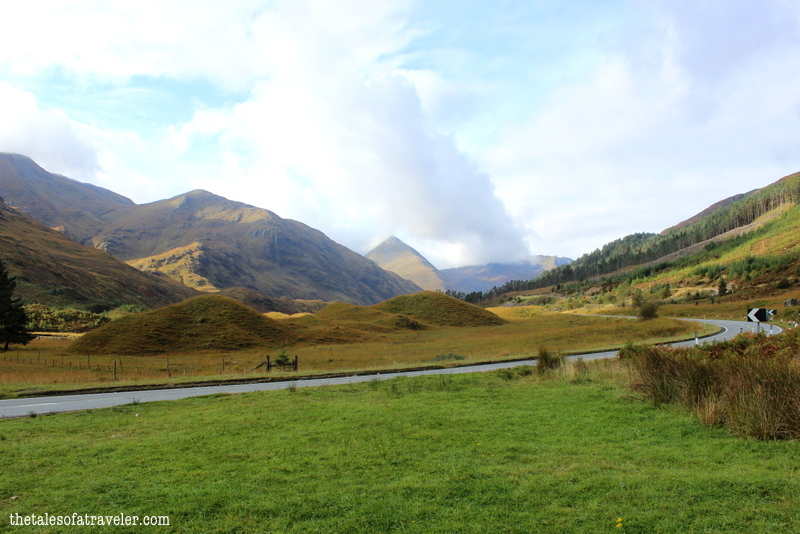 At Kintail, we stopped by Glen shiel which is encircled by steep mountains from all the sides. It was the same place where the battle of Glen Shiel took place on 10 June 1719, between British government troops and an alliance of Jacobites and Spanish. 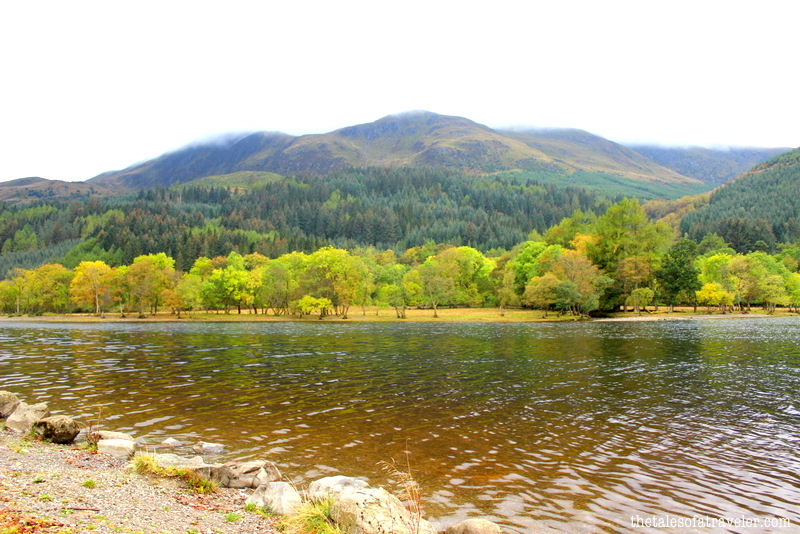 Another one of the places in Scotland which you might miss if you are traveling on your own. 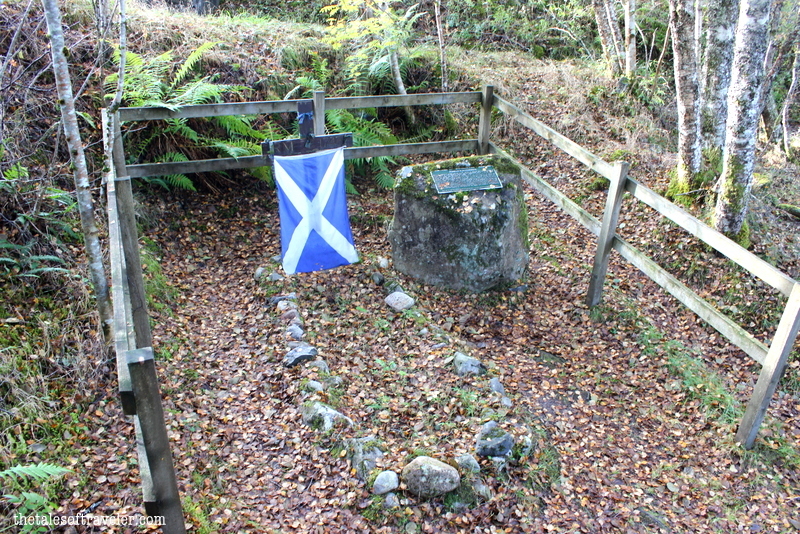 This place is just a little off the road and here rests one of the bravest souls of Scotland who helped in changing Scottish history by helping Prince Charlie to escape government forces. Roderick Mackenzie had a quite a resemblance to Prince Charlie of Scotland. While fighting the government forces, Roderick was fatally wounded and his last words were, “You have killed your Prince”. This made the government forces believe that they had killed the Prince and search for Prince Charlie was stopped. This helped Prince Charlie to escape from Scotland unnoticed. 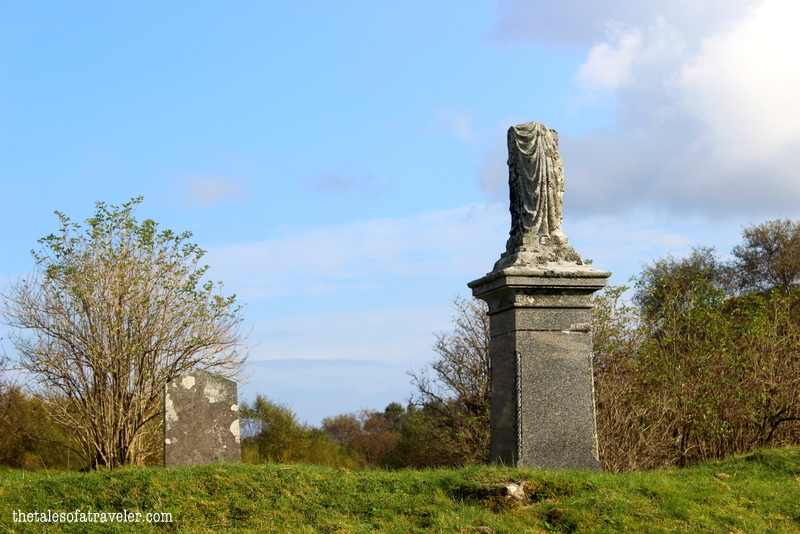 The grave of this selfless man lies off a quiet road, beside the river Moriston. A simple grave with a wooden cross on top of it. Visit to Scotland without Nessie hunt is incomplete. 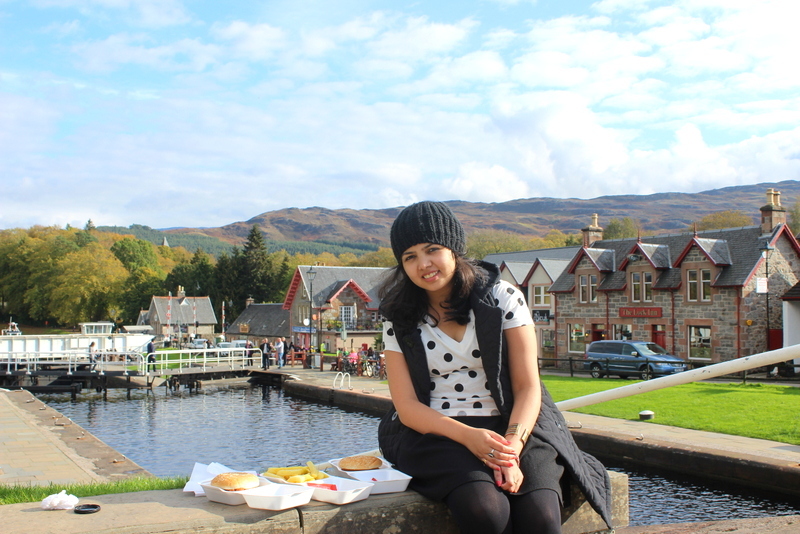 So, we had to stop by Loch Ness at Inverness which is one of the most popular places in Scotland.At Loch Ness we had the option of taking a boat tour for Nessie hunting, or we could just stay in town. We opted to do the later as we knew there was zero chance of spotting Nessie. So we grabbed a burger and some french fries from a local burger shop and then made our way down to the waterfront. We sat there under the October sun and enjoyed a hearty meal. Then we wandered around the town looking for souvenirs to collect from the cute little shops while are lined up near the riverbank. After having lunch at Fort Augustus we started towards Invergarry Castle which was built by Clan MacDonnel and served as its seat of power for a very long time. The castle as of today is in dilapidated condition and it has been fenced off so that the tourists are not harmed. You cannot go inside the castle but can only view it from the outside. 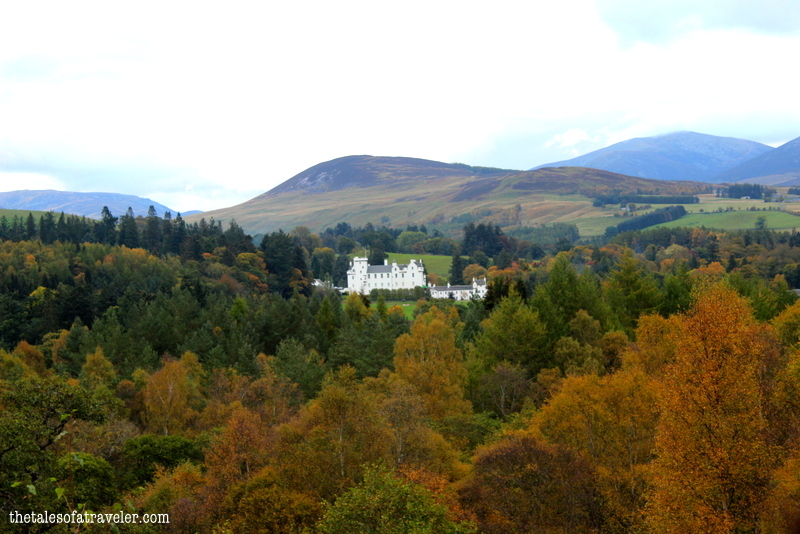 While driving eastwards towards Edinburgh, we passed by Blair castle. The castle is situated at a distance from the main road. As it was getting late we could not go to the castle but got some photo ops from the road. 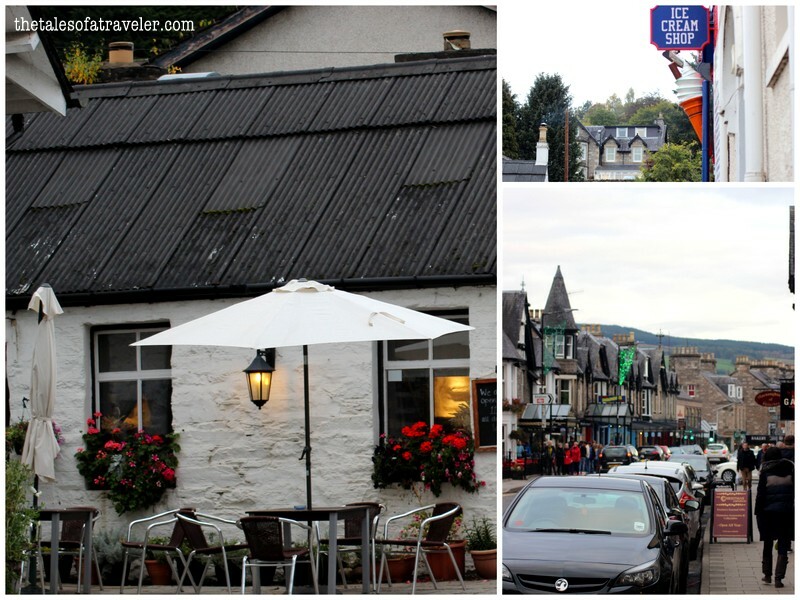 We began our journey back towards Edinburgh traveling the eastern route stopping by Pitlochry, a cute little town with so many ice cream shops and cute cafes. Even Mac played the Scottish bagpipe for us at Pitlochry. How sweet of him 🙂 Couldn’t imagine any better end to the trip. Finally around 7:30 pm we reached Edinburgh and headed to our hotel to rest our tired bones with memories of thoroughly breath-taking landscapes safe in our heart and fresh in our minds. You can book your stay on your own or cute little B & B’s can also be arranged by Rabbie’s at Portee. We preferred going with Rabbie’s to book our stay, they booked for us a cute little B & B cottage at Portee which was close to the city center. In the evening we could just walk down for dinner and stroll on the mety streets of portee. Portee is a very small town and most of the shops close by 9 so make sure you gobble down dinner early. You just have to indicate what type of accommodations you prefer a hostel, hotel or B & B’s and according to your preferences the stay can be booked by Rabbies. It was one of the wisest decision to go with Rabbie’s tours. As seeing so much in such a less time would not have been possible. The staff were knowledgeable, we didn’t have to worry about the correct route, location or traffic. And above all who would have told us so many stories about fairies, witches, clans, Prince Charlie and the fascinating Scottish history. We would highly recommend checking out Rabbie’s Trail Burners for your next tour! Thank you so much Rabbie’s Trail Burners for hosting us. Opinion as always is our own. Wow… such a beautiful place this is… Thanks for sharing! Lovely pics….and I so want to see the Hogwarts express line 😀 SIGH! 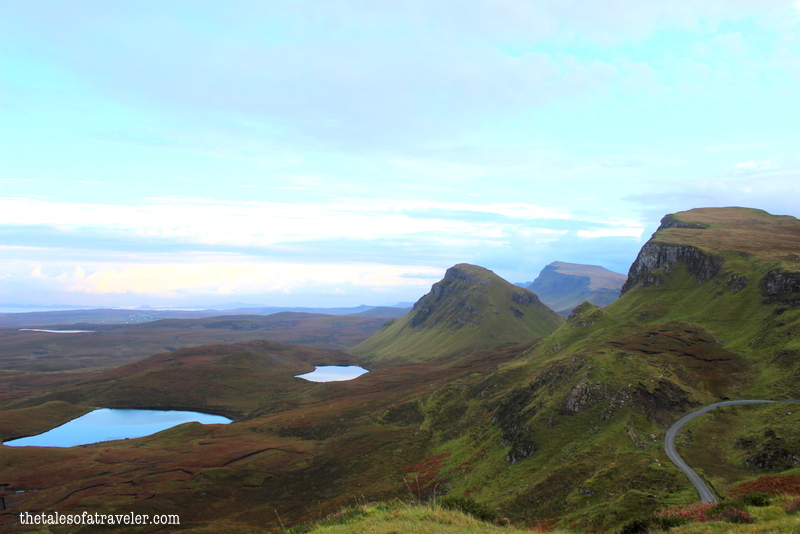 I loved the Isle of Skye! Wow is the only word which comes to mind! Lovely captures, makes one dream of going there. Very lovely beautiful pictures and lovely post…..
Wow, this trip seems really fun! Could I check, how much did you pay for accommodation as rabbies didn’t state the full price per room for each person. Hey, loved your blog ! very informative and beautiful. We are planning a trip to scotland and plan on doing the rabbies 3 day isle of skye tour as well. Also the breakfast was included within the total price,right? Will appreciate a quick response from you. Many thanks for writing to us. We opted for an ensuite B&B and paid 100 pounds for 2 nights for us which also included breakfast. But they do have options of hostels and hotel too. However, you can also book your own accommodation in Portree and they would drop and pick you up from the place. We did not opt for the same as we could not find any interesting listing on AirBnb in the town. Hope you have a great trip. Scotland is surely a country with an attractive landscape. I’ve always imagined being in those long train journeys, with plenty of rain sticking on the windows — but with enough visibility to experience the views. Road tripping is definitely an amazing way to meet, truly meet, a country. Scotland’s a beautiful country isn’t it? Especially the Highlands region. Reading this post does take me back – it’s been a while since I visited, but I have been to most of the places here. 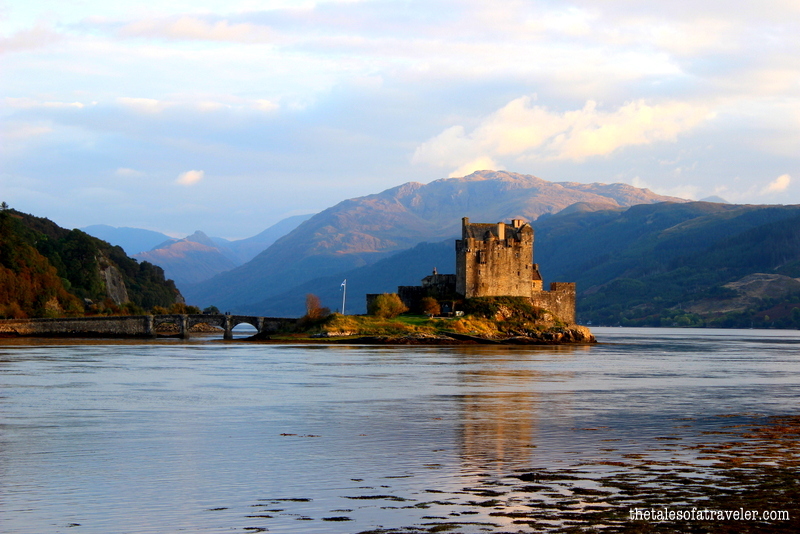 My favourite is probably Eilean Donan Castle, a beautiful structure with such a evocative and picturesque setting! Such an exhaustive list! The castles of Europe charm me a lot and Scotland has plenty. Hopefully I make it there some day. Awe-inspiring vistas these are! Scotland is a delight fro the lovers of hills. The settings here are epic. I was frequently reminded of the film Braveheart while going through your post. The Hogwarts line of course is another bucket list item for many. You manage to see so many places in only 3 days. I have also been fascinated with the stories of Scotland for a while now. Would love to visit this year hopefully. We too had been on a tour to highlands but it wasn’t this extensive and looks like we missed on so much. Your captures are surreal and want us to go back there again. The colors of fall have been captured beautifully. That was a great road trip. 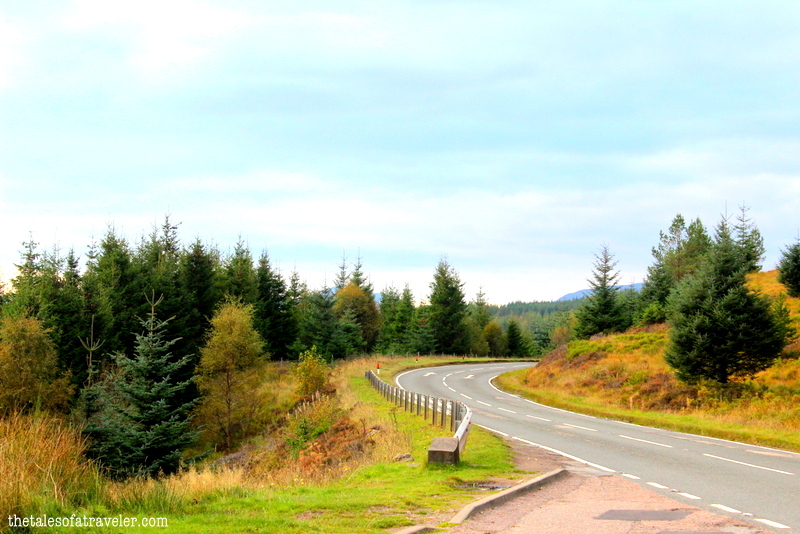 We recently went on a road trip around Scotland in a car. I’m glad there are tour companies, like the one you used, that can take care of the driving for you, as it can be a lot of driving, and plus not everyone has a drivers license. 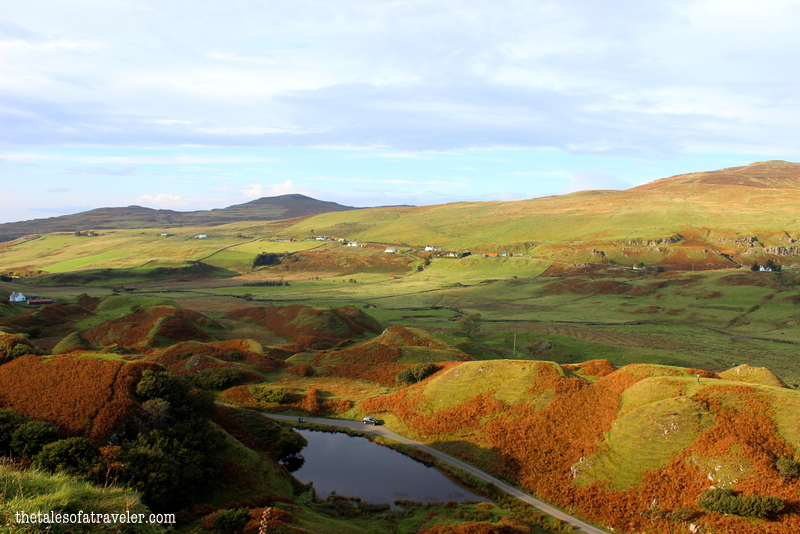 The colors Scotland provides are incredible! the pictures you have I am sure do not do it justice. It really sounds like you picked the perfect tour group to see everything. Sounds like you had a great time. Hi Swati and Sam, this post is a labour of love from both of you. It indeed is vast post and reflects the thrills that you guys got on this tour. I am intrigued by Saint Columba. Is he the same person who has lent his name to the famous school in Delhi? The graves are interesting. I don’t think that similar graves exist in India. The castle that you wrote about is another interesting monument. Though old, it now hosts marriage parties, wow! My best friend is from Scotland and she speaks about all the vineyards and laid back lifestyle in the countryside. I would love to experience it some day! What a great itinerary! 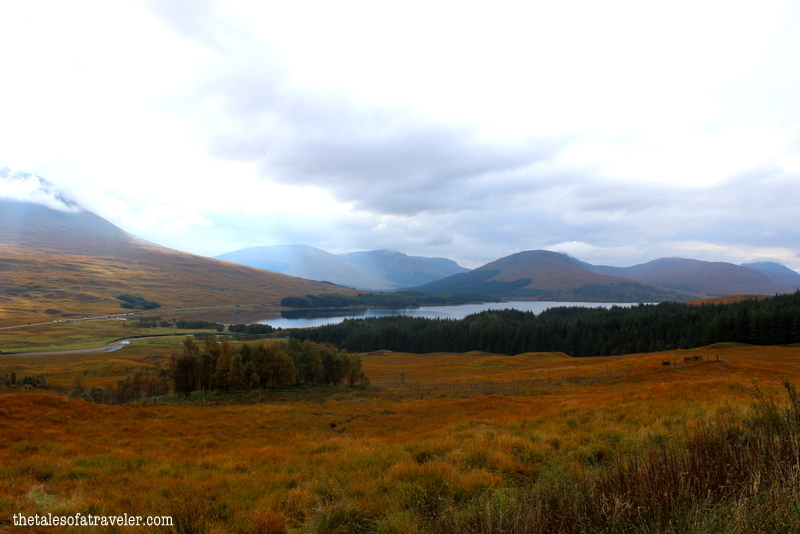 Every time I am looking for photos from Scotland am asking myslef why I still didn’t go there yet ! It looks so different than modern London where I live, feels like completely different world! Love your photos ! It seems a great tour! Scotland, as always, is breathtaking, but a tour operator can all spoil it for you or on the contrary, make it unforgettable. It’s good to hear that these guys have done a great job with the tour. Wow, Scotland has some really beautiful scenery. And I love the Scottish folklore stories too. Sorry you did not see Nessie, hehe. This was absolutely stunning to see and read. I am so jealous you were able to do this. I love all of the facts that you were able to share and how authentic Mac was. 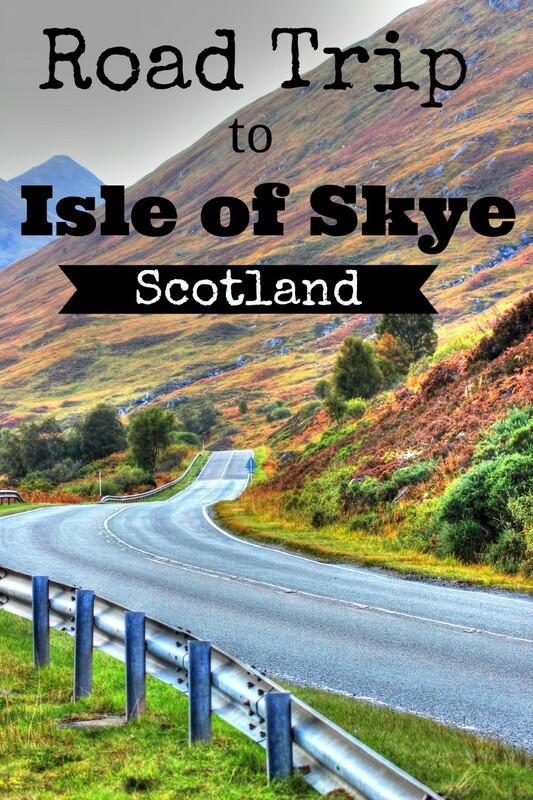 I can’t wait to be able to go to the Isle of Skye. 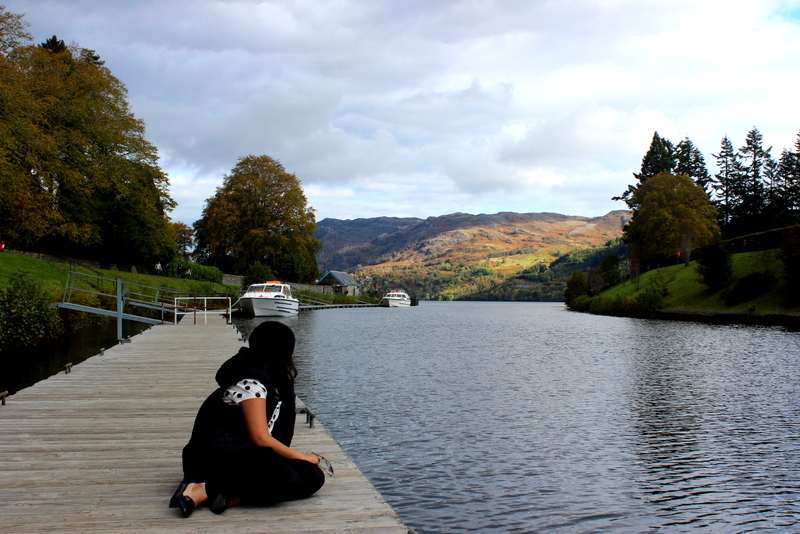 Scotland is such a dream destination! Awesome road trip!